Thanksgiving dinner is my all time, number one, favorite meal. My grandma cooked the most amazing Thanksgiving dinners that I have ever had, hands down. A perfect turkey and stuffing every single time, some years she even cooked a ham and a turkey, every side dish you could imagine, delicious rolls slathered with butter, the absolute best giblet gravy, apple pie, pumpkin pie, she even buttered and cinnamon and sugared the leftover pie crust so we could snack on it. Exactly the same every single year, which is just the way I liked it. I don’t think I’ll ever find anything as good again. I consider myself deeply blessed to have been a part of at least 30 of her Thanksgiving meals. What I didn’t realize until I got older, was how much time and work goes into making a true “grandma style” Thanksgiving dinner. Wow, it’s a ton of work and a labor of love, for sure. And the dishes afterward for 10-15 people or more? Yikes. Not wanting to wait until Thanksgiving to enjoy my favorite meal, I found a way around it that isn’t quite as much work. 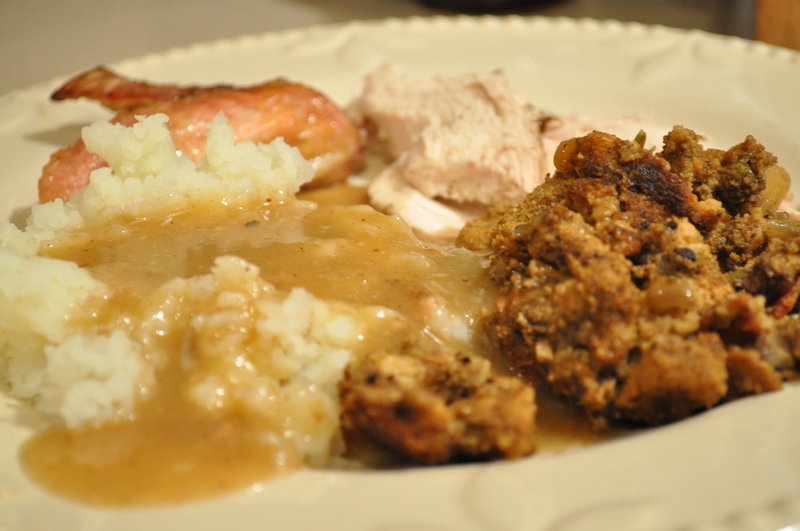 And of course I needed to come up with a gluten-free stuffing. A few times a year I stuff a chicken and we have it with mashed potatoes and gravy, a vegetable side dish (only 1 instead of 3 or 4 like Grandma used to do) and of course, a pie. Still work, but not as much as Thanksgiving, and oh so worth every single bite. I love how food can evoke so many wonderful memories of the people we love and the fun we had while we were together. Wish she was here to see my new blog. She’s the original “foodie” in the family. She would be so pleased to know that all of those years I watched her in the kitchen I really was listening and learning. Cube the bread and place in a large bowl. Add poultry seasoning, garlic, salt, and pepper. Toss gently with your fingers until ingredients are combined. Gently pour out onto lined baking sheet. 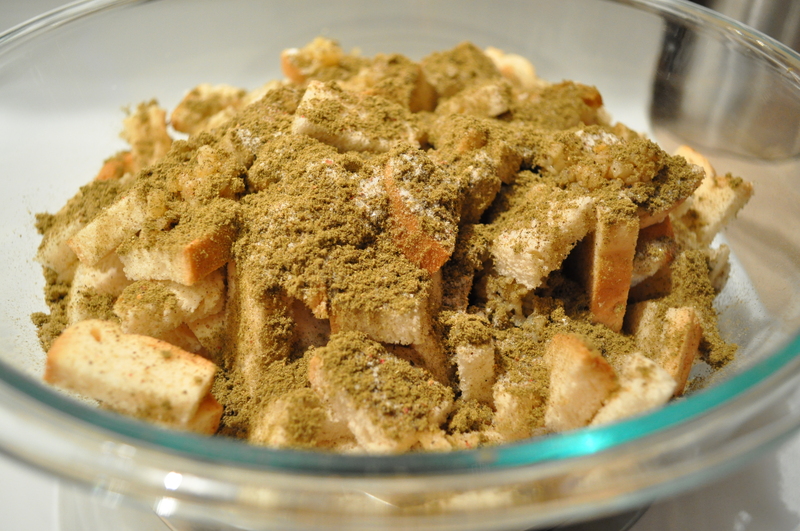 Some of the seasonings will fall to the bottom of the bowl, make sure you add these to the cubed bread on the baking sheet too. Bake, turning with a spatula every 20 minutes until dry and crisp. About 60-80 minutes. While the bread is browning, slice the bacon and prepare your vegetables. Drizzle a small amount of olive oil in a non-stick skillet. 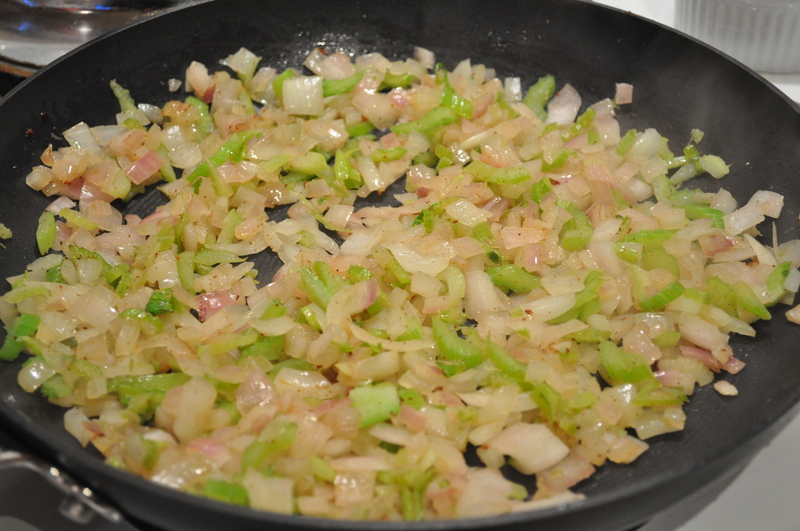 Fry bacon until browned and lightly crisp. 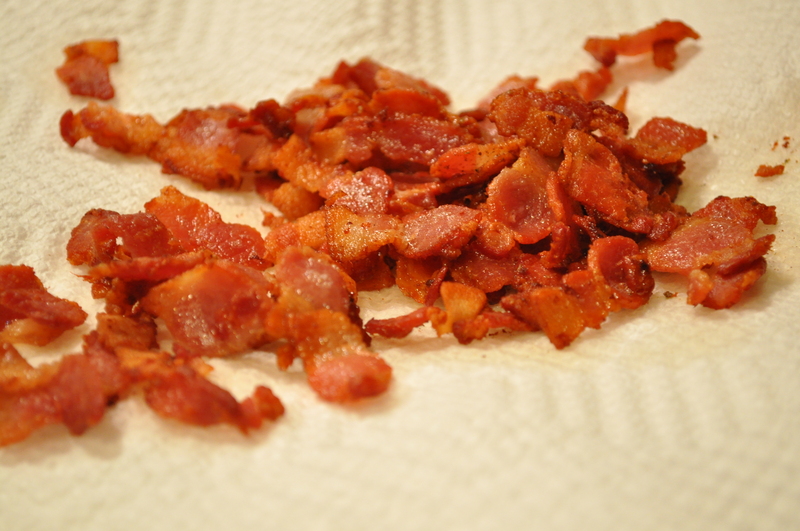 Place bacon pieces on a paper towel and drain bacon fat, reserving 3 Tbsp. in pan. 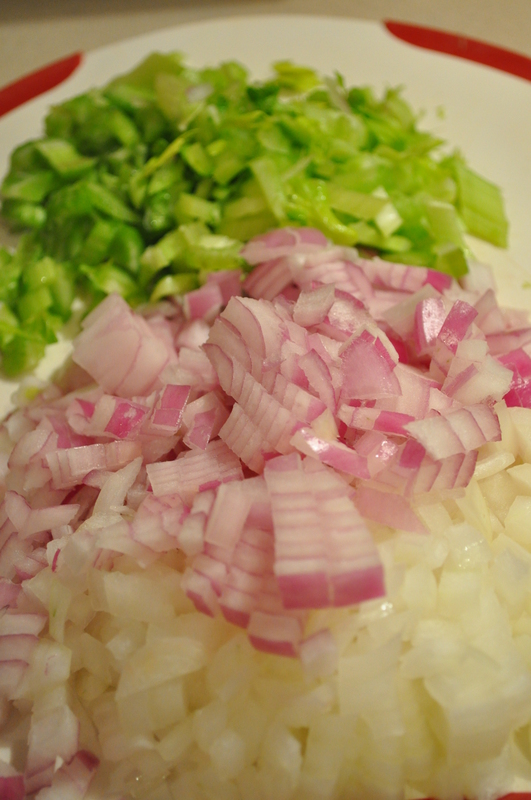 In the same pan with the bacon drippings, add the onion and celery and saute until onions are translucent and celery is al dente. Set aside until bread cubes are done. 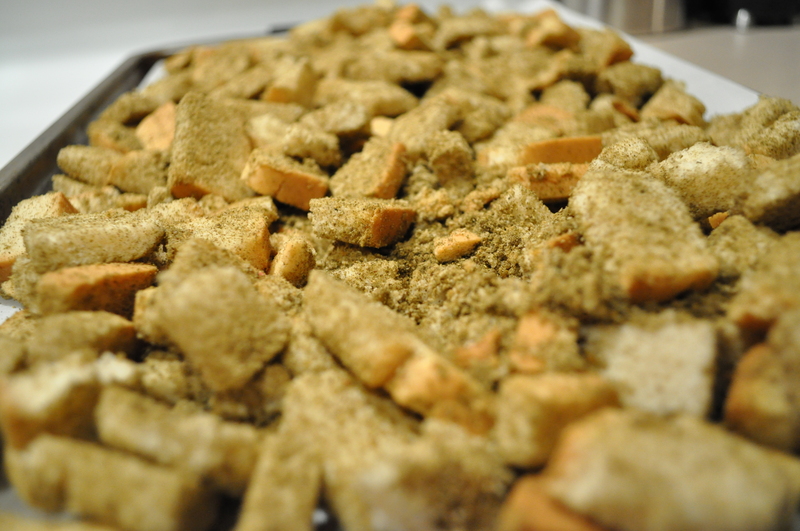 Properly toasted bread cubes should look like this..
Once the cubed bread has cooled, pour into a large bowl. Warm 3 cups of chicken broth and add 2 Tbsp. 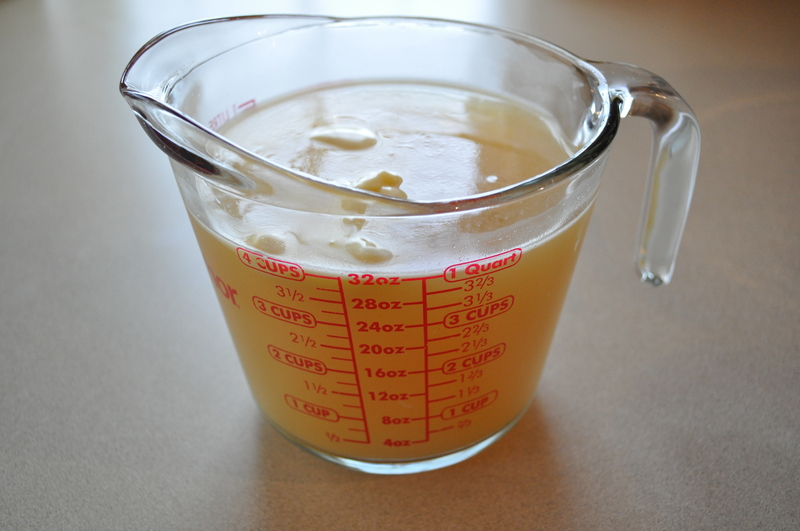 dairy free butter (or real butter) to the broth. The picture shows 4 cups of broth, but I only used 3. 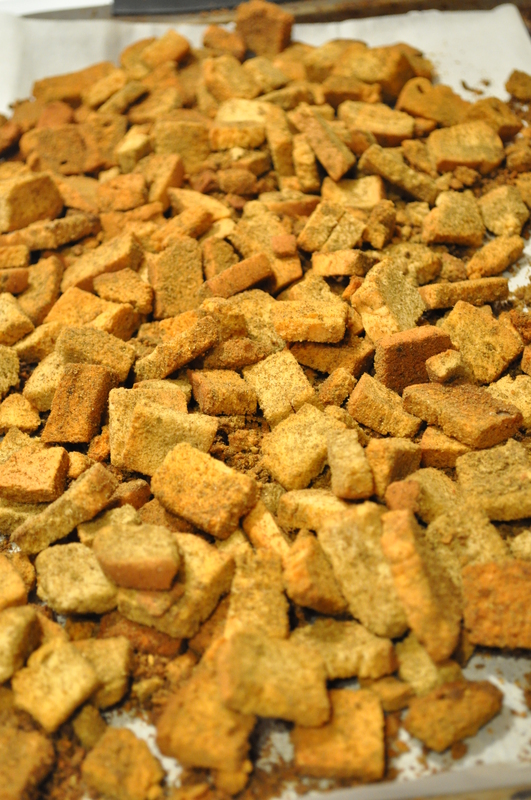 Taste bread cubes and if necessary, add another tablespoon or so of poultry seasoning and salt and pepper to taste. Slowly add warmed broth into cubes tossing carefully until 2 – 3 cups of the broth is absorbed. This will also depend on how you like your stuffing. If you like it moist, try to get all 3 cups absorbed, if you like it a little dry, use 2 cups. Then, either put it in a 8 inch square pan that is sprayed with non-stick spray, or stuff your bird. If you bake it in the pan, pre-heat oven to 350 degrees and bake until the top is browned and crispy, about 40 minutes. A 6 lb. stuffed chicken usually takes about 1 hour and 45 minutes to 2 or so hours at 375 degrees.